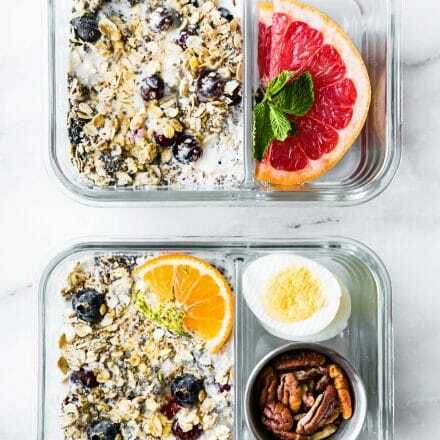 Need a quick healthy Breakfast recipe? 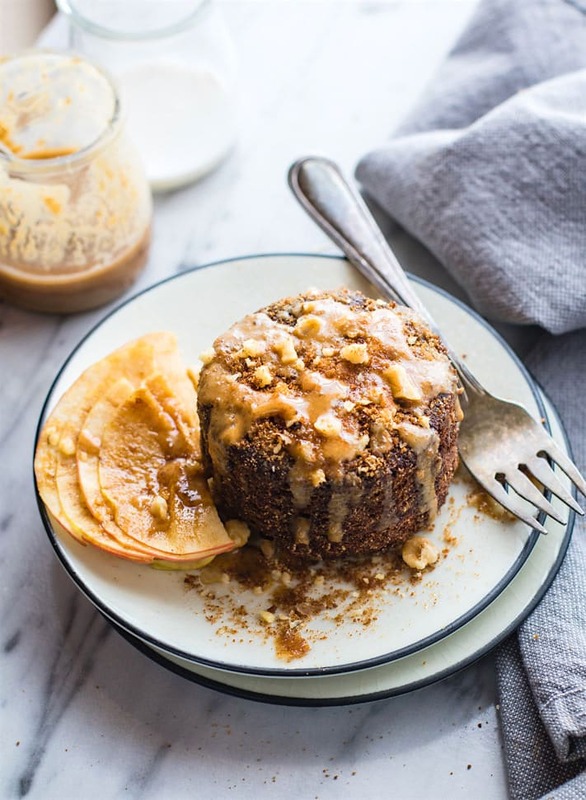 Try this deliciously tasty Vegan Apple Pie Peanut Butter Mug Cake! A vegan mug cake that taste like dessert! Grain free, gluten free, kid friendly, and ready in less than 2 minutes. Over the past month I’ve made over a dozen mug cakes. No joke! I’ll explain in a minute, but first. Let’s talk about mug cakes. Wish I would have been the one to invent them. Yes, they are super duper handy and tasty. Alas , I did not. But I did invent a vegan mug cake that taste like apple pie and peanut butter combined. Like for reals. And speaking of FOR REALS! Oh boy have things changed this past year. You all know this. New career. New schedule. New meal plans and trying to get a eat a variety of gluten free foods. That being said, mug cakes have become our best breakfast buddy. They are super quick, healthy, gluten free, and . pair well with coffee of course. My last mug cake creation was made up of banana, quinoa, egg, and chocolate. Yup. Good stuff y’all! This time around, I was aiming for a vegan friendly mug cake. Or rather, one that didn’t need eggs. We love eggs, but if I go over board on egg consumption, I tend to develop more of a food sensitivity too them. Oh that’s a topic for a whole other day. So I think it’s important to vary the type of food you eat. Capeesh? Anyway, where was I? Oh yes! 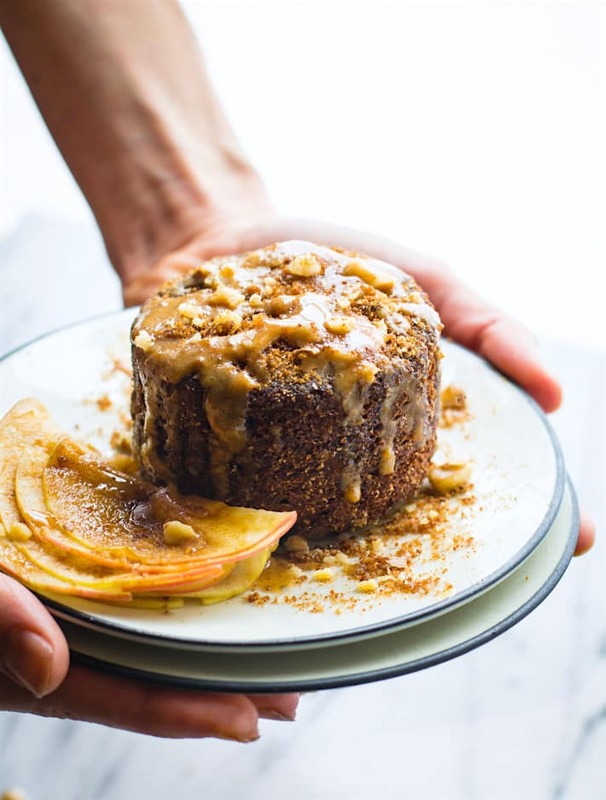 I had absolutely no problems making this apple pie peanut butter vegan mug cake. Despite the long technical sounding name. Haha. It’s quite simple and boy does it make for a delicious breakfast cake in the morning. Ya’ll, Think of this as Apple pie meets peanut butter cookie meets muffins. All made in under 1 minute. Hallelujah praise the chemist Gods! A dessert style vegan mug cake made with simple kitchen items. Not to mention AWESOME organic ingredients from my friends at Better Body Foods! 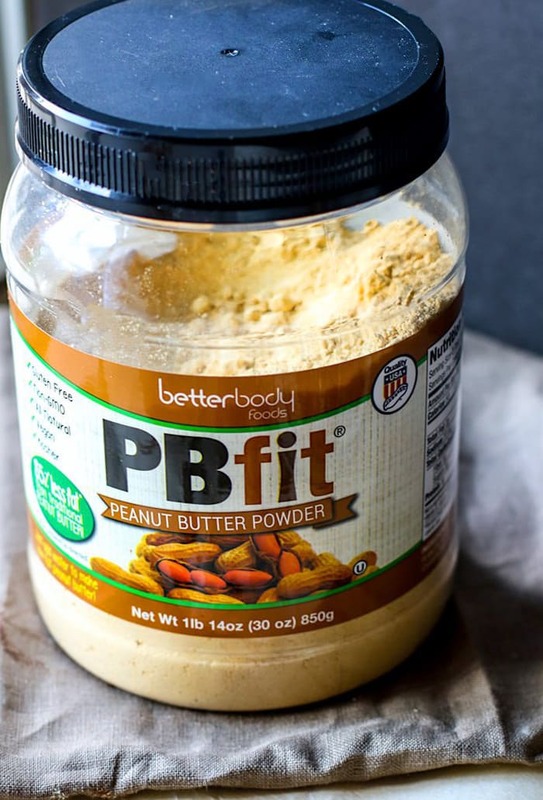 Peanut flour – If you’re looking for an awesome peanut butter flour, then check out Better Body Foods PB Fit Peanut Flour. It’s what I used here and it’s available online and at Walmarts nationwide! Uhh.. That’s it, all you need for instant cake ya’ll! Grain free and vegan. Soooo flipping good! You see, when you take an acid (think Apple Cider Vinegar) and a base (think Baking Soda) and combine it with oil and water (a neutralizer), then eggs are not needed. You can create a fluffy voluminous cake with theses leaveners. But the key is getting the right amount of each so that the bubble triggered by moisture and/or heat. Oh my gosh, was that too much nerd talk or what? Either way, if you have food allergies, it’s always good to know what you can do to replace eggs, dairy, grains, etc. within a recipe. Right? Mug cakes are good recipe to start experimenting with. Plus I love how simple this one is. And like I mentioned before, the apples, spices, and peanut butter combined make this vegan mug cake taste like a Starbucks danish coffee cake on crack. Or maybe I’m exaggerating.. no, no I’m not. Or maybe your not thinking that and you just know I’m a weirdo. Well that too. 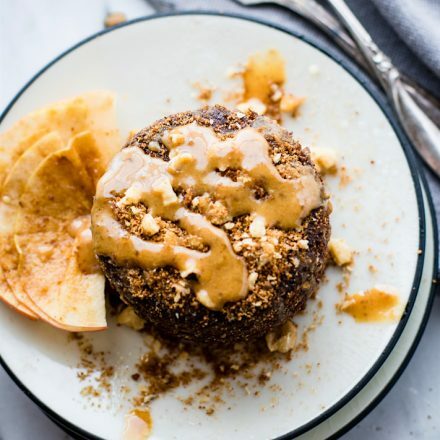 The reason why I have such a hard time with this vegan apple pie peanut butter mug cake was actually quite comical and had nothing to do with the recipe. In fact, it was just my OCD tendencies. Ugh, My nemesis when it comes to blogging. I cannot for the life of me figure out how to make a vegan mug cake look simple yet still pretty. Guys, you know I’m all about the pretty food factors. First world problems. Needless to say, 12 microwave vegan mug cakes later and I took at least one picture I like. 12 vegan mug cakes made in less that 15 minutes. That’s pretty impressive though, right? Definitely feeds my apple pie and peanut butter dessert obsessions appropriately. Plus, making 12 mug cakes all at once made for perfect breakfast meal prep and a happy husband who didn’t have to go looking for breakfast come 5am. Haha now that’s winning! 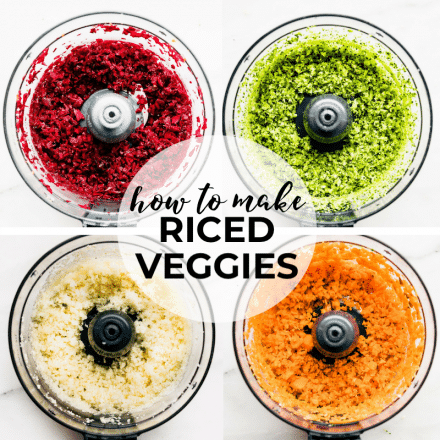 Friends, whether you are a nutrition nerd, in need of a super quick vegan/grain free breakfast, or a kid going back to school, I gotcha your latest food obsession covered. All in just a few minutes. Oh and if you’re looking for a mug cake with a little more ZEST, try Fearless Dinning’s No Bake Lime Gluten Free Mug cake! 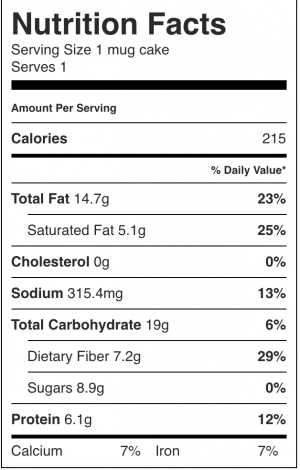 Nutrition Estimate without the Topping. It also depends on the peanut flour/powder you use. 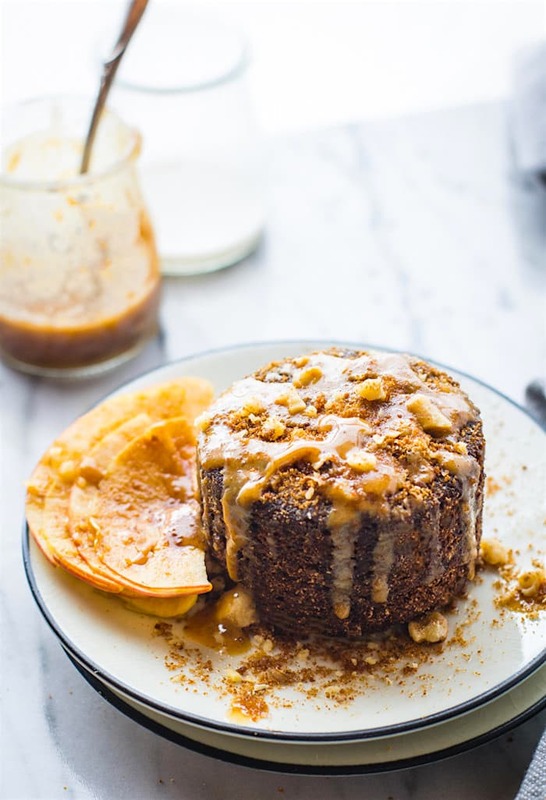 Vegan Apple Pie Peanut Butter Mug Cake! A vegan mug cake that taste like dessert! 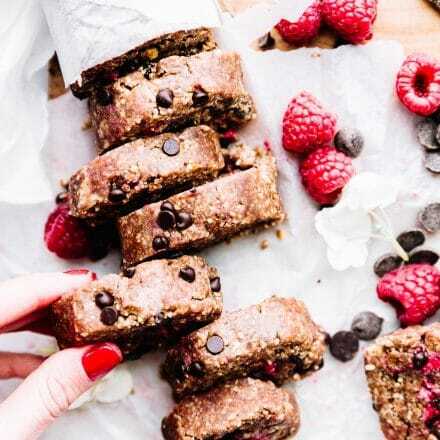 Grain free, gluten free, ready in less than 2 minutes. 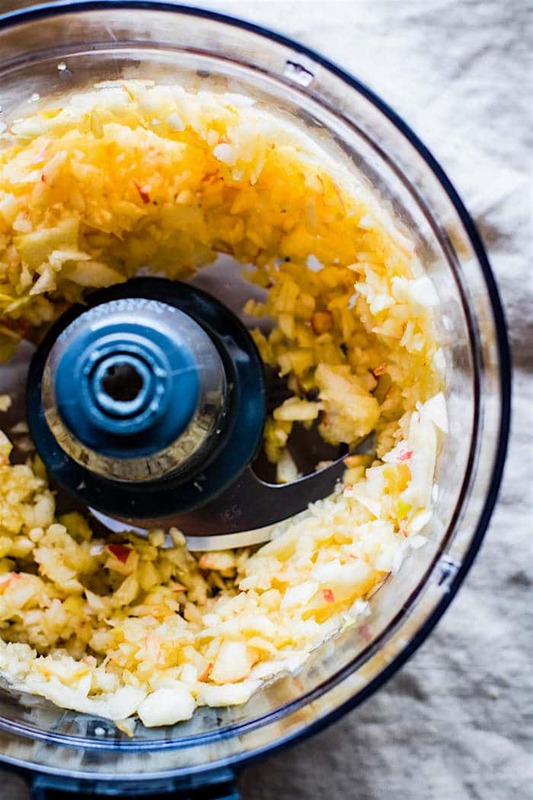 First chop an apple or place in food processor. You only need a little bit so save the rest for another mug cake later. Next place all your dry ingredients plus apple in a bowl. You could use the mug you are using but I find that it mixes more evenly in a small bowl first. Then place your oil, vinegar, and extract in three different spots on top of the dry mix. Pour your water on top and gently stir. You will see a few bubbles. Pour this mixture into large mug that has been greased or oiled. *Notes: * Since the peanut flour and coconut flour are thick, you will need to press this mixture down into the mug with a spoon or hands, gently. Microwave on high for 90 seconds to 2 minutes depending on your power. Check at 90 seconds if you want to be sure it’s rising. Remove from microwave, let it cool a minute. Flip over onto a plate. Drizzle with a few 2 tsp of melted peanut butter, a 1/2 tbsp chopped nuts, and either a cinnamon sugar or maple syrup. feel free to add more apple on top too! DIG IN!! Repeat for another. Go for it! These keep well in fridge all week and are great for snacks! If you don’t have peanut flour, try a gluten free flour or a vegan pea protein. Start off with microwave 90 seconds. Adjust time from there depending on your microwave power. Apple Pie Peanut Butter Mug cakes are where it’s at! Do it, try it, add the extra peanut butter sauce, make it look pretty, whatever you fancy. But most importantly, feel HEALTHY! And that will conclude my corny Cotter moment. 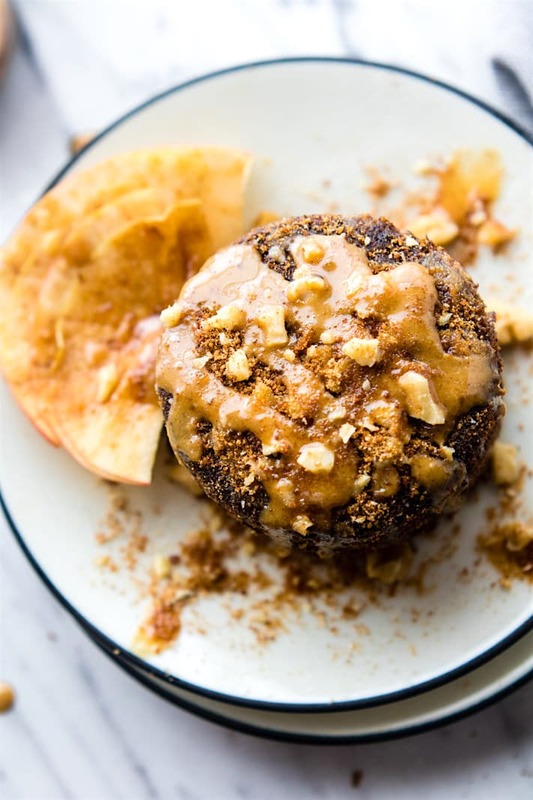 This tasty Apple Pie peanut butter Vegan Mug cake recipe creation is sponsored by my friends over at Better Body Foods! Thank you for allowing me to share their wonderful products and talk about this caring company. What’s your latest obsession? 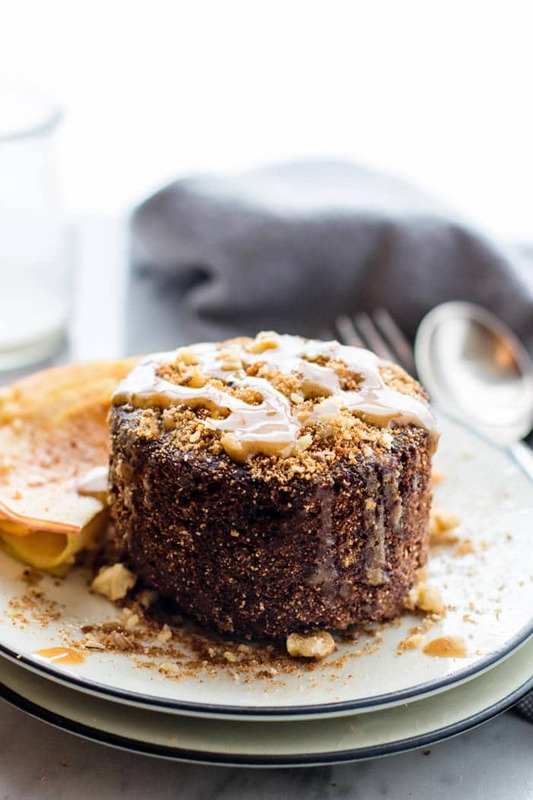 Have you tried vegan baking a dessert style vegan mug cake? p.s Love this article on baking leaveners and how to use them. Super helpful tips! ← Zesty Mango Spiralized Cucumber Salad and Spiralizer Salad Favorites! Just my opinion, but I think you have your food styling down to a science just like your vegan mug cake, lol! But maybe it’s your OCD tendencies that make the photos THAT good 🙂 Either way I loved the science lesson on the mug cake (need to try!) and the photos are gorgeous and make me want to bit through the screen! I haven’t tried their powdered peanut flour. I’ve tried quite a few, but not that one. I need to get some more peanut flour, actually, I’m increasing calories, but I still use peanut flour for so many things. And the reason that I don’t post many recipes is because of food styling! Oh but seriously you’re pictures are always amazing! But I know what you mean about being OCD about it. I’ve gotten particular! This mug cake sounds phenomenal! I eat eggs like they’re going out of style but I just love them so much! I am obsessed with making mug cakes and I know I would love this because who doesn’t love apple pie and PB!? And I'm glad you made it egg-free! I get so angry when people put unnecessary eggs in mug cakes! Hahaha! ahh yay! egg free happiness! Let me know whatcha think Mere! I’m in LOVE! Bring on apple season! Ooo! Yum!! I love mug cakes, and any way that I can enjoy peanut butter in it is a win. Plus APPLE PIE!? YOu could try it! I don’t think it will be as voluminous though. Still tasty! keep me posted. This sounds amazing. And once I discovered mug cakes it was a crazy mug-athon that I needed to calm down haha. I think we should do a “Dessert for Breakfast” swap today!!! 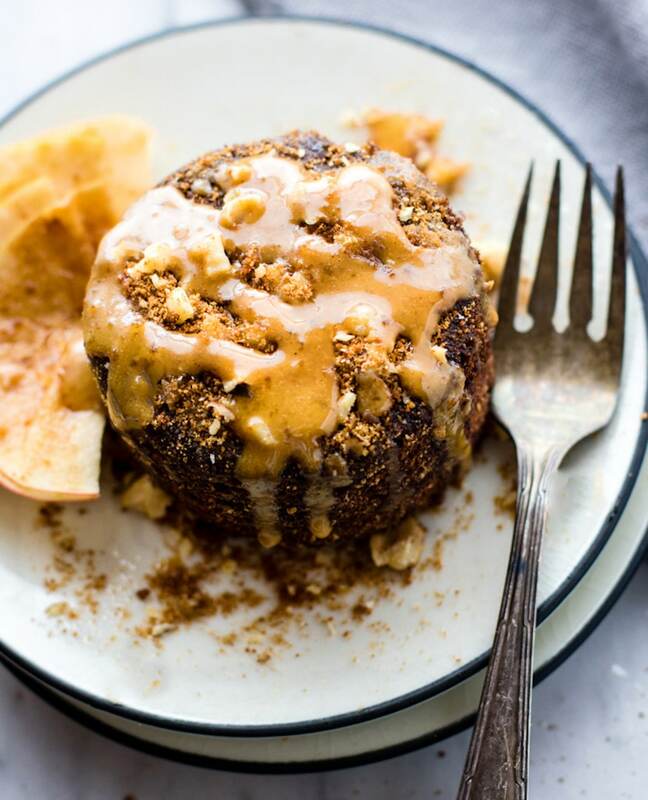 This looks absolutely amazing, and you seriously nailed the photos-vegan mug cake never looked so gorgeous! This looks SO devious! and perfect to make in a college dorm room! I am a huge mug cake fan! love the PB flour idea… Heather (broccoli) made one like 4 years ago that I liked a lot. Can’t wait to try this one with apples! I miss heather and YOU! I think mug cakes look and sound SO good, BUT we don’t have a microwave…any suggestions as to how I can bake one?! you could definitely try baking it in a pyrex mug or small round dish. Try 350F for 15 minutes and just watch it. Should work, might not be at fluffy but will definitely bake! I saw this on Facebook earlier and was drooling! Peanut butter and apple were made for each other! Even better in quick and easy cake form!! I so agree!! Best ever combo! hehe. But I still want to come!! Please? I have never had a mug cake, but this looks like an absolute must makenn I even have some of the PB2 powdered Peanutbutter in my pantry ? yea! let me know if you try it! Oh yes, this is totally getting some mad pin love because it’s BEAUTIFUL and sounds sooooo tasty. I used to mug cake it up all the time, then I sort of got out of it. But you’ve reminded me how amazing mug cakes are and how AMAZING this recipe is! LOVE mug cakes! And your pictures look great, Linds. Wow this looks so delicious. Cake for breakfast Count me in! This would be the perfect dessert, snack OR breakfast… or all of the above… because it looks like the kind of thing you make once and then can’t stop making! Yum! Oooh Ooooh ooohh! I’ve seen the PBFit in the stores and have been so curious to try it! I love mug cake recipes too because they are so easy! Love this flavor combo too! Making those 12 cakes definitely paid off because this one here looks A-MAZ-ING! You have so many goodies packed in here and the flavor profile sounds so delish! haha thanks! i need to share all these. COme visit! Hi. I”m Jill and I’m addicted to mug cakes. How can you not like the single serving easy to make cups of goodness? Oh my goodness! This a little cup of mug cake perfection. Practice makes perfect! i’m a pro now. LOL! After seeing how good this looks, I can’t believe I haven’t made a mug cake yet!! That’s about to change. This recipe looks too good to pass up. YUM! Pinned! woohoo! let me know if you try it carly! These sound and look fantastic! I love the idea of adding ACV. 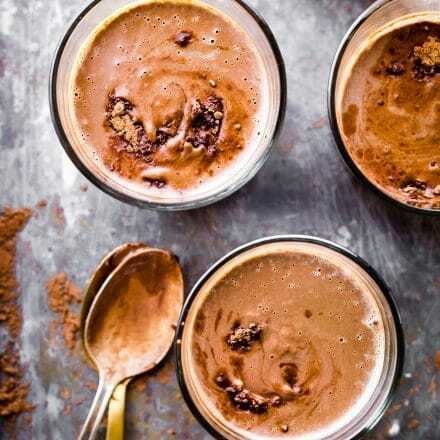 I have been making lots of simple chocolate mug cakes lately with eggs or egg whites, so I will have to try this version. Oh my gosh this looks amazing. Why don’t we have mug cakes like this for breakfast more? For reals! plus it makes me look like an awesome baker without even baking haha. I’ve never seen a more delicious looking mug-cake in my life! I HAVE to try this out when I buy peanut flour again! I use It a lot with no bake bites. Are you looking for more baking and cake recipes? I want to eat this so bad. Looks DELICIOUS! These look so delicious! 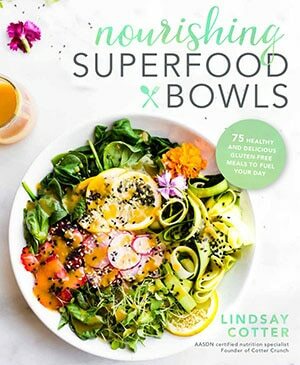 I have recently found out about some auto-immune diseases that have explained so much about the pain and torture of the many past years of my life and eliminated gluten and dairy, and loving your recipes (found you through Taylor Kiser when you connected through the awesome bowl recipes…I have been living and loving bowls), but through food sensitivity testing have issues with peanuts (and lot’s of other stuff, slowly testing them all). I used to love PB2 and other powdered peanut butters so much, but cannot find another powdered nut butter. Do you know of any? 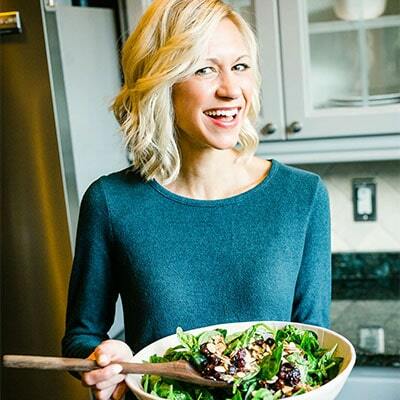 My mom has been gluten and dairy free for years and I fought it, and I wish I listened sooner. We all have the celiac gene, but are just outside of the range for biopsy. Thankfully, I have learned a lot by cooking for her, but it makes a big difference when I am making recipes for me. My youngest has a tree nut allergy, so I have been leery of bringing in items that contain those ingredients (I have to hide my almond milk and recently after finding about peanut sensitivity, my almond butter), so I am grateful for some things to try that could be around him. I have been experimenting with pea protein powder for a long time. I have found an issue with those containing hemp, but the gi effects are not as bad when just pea protein. I will try the chick pea flour for sure! Thanks for your fast reply! I’ve never actually made a mug cake because they all look so horrendously unappealing… that was until I discovered THIS ONE. I’m sure I’ll be bitterly disappointed with the look of mine in the end but if it tastes half as good as it looks in your photos I know I’m going to love it! Wait, a Chocolate Banana one up there? haha go for it! stuff away! Actually, I had one person try that! it works, just doesn’t rise as much. And obviously you have to bake longer. LOL! Let me know if you try it David!